This chapter assesses the change in the tax burden on households across the various income deciles during the period between 2003, the fiscal policy “watershed” year, and 2011. This chapter assesses the change in the tax burden on households across the various income deciles during the period between 2003, the fiscal policy “watershed” year, and 2011. In both 2003 and 2011, the direct tax burden, defined as the ratio of tax imposed on income to gross income, increases along with income. By contrast, the indirect tax burden, defined as the ratio of tax imposed on consumption to net income, declines along with income. Moreover, in the two years examined, the total tax burden, defined as the ratio of tax paid to gross household income, declines between the bottom decile and the second decile, remains almost unchanged up to Decile 7, and then rises. 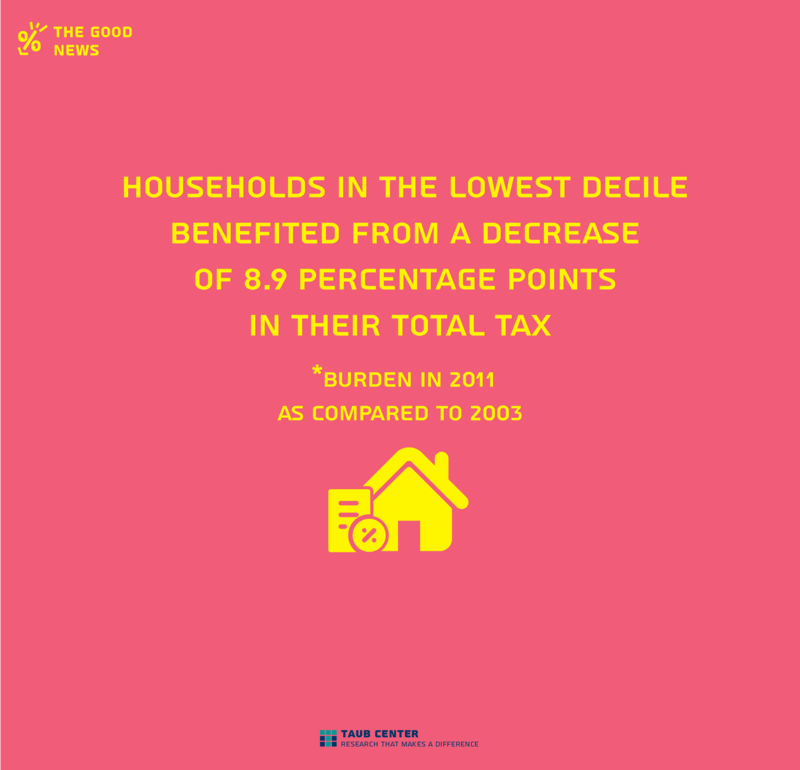 In 2011, the total tax burden on households in all income deciles was lower than in 2003, but the decline was uneven. The tax burden declined more substantially at the extremes of the income distribution, i.e., in the lowest and highest deciles – meaning that it became more uniform between households. In absolute terms, households in the lower deciles (Deciles 1 to 5) benefited from a tax burden reduction of NIS 130 to NIS 430 per month, while households in Deciles 8 to 10 had a reduction of NIS 800 to NIS 2,500 per month. The fact that direct taxes became less progressive between 2003 and 2011 and served to maintain, and in fact widen, net income disparities between households.